Have you ever wondered what jobs we will do in the future, or why some brands of shoes cost more than others? What about why some footballers get paid so much or why some people are poor? 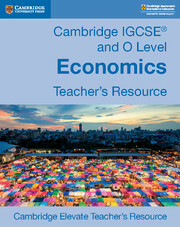 Explore these and many other questions as you begin your study of economics. Working in groups and on your own, you’ll learn to make judgements and see how economics connects with your life. 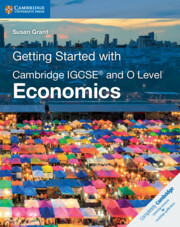 You can use this book alongside the coursebook for extra support or as perfect preparation before Cambridge IGCSE or O Level Economics. 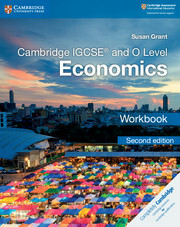 Answers are at the back of the book, giving teachers the option to set it as summer work before students start studying economics. 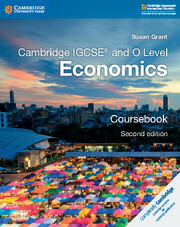 This book is useful preparation for anyone studying Cambridge IGCSE or O Level Economics. Individual and group activities give students plenty of practice using economics terminology and skills. Independent reading suggestions help students learn more about economics while getting them used to going beyond their textbooks. 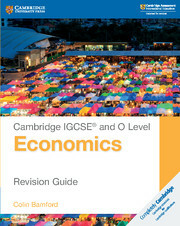 Key terms throughout the book highlight important economic words and phrases to help students build their knowledge. End of chapter questions help students reflect on what they’ve learnt. 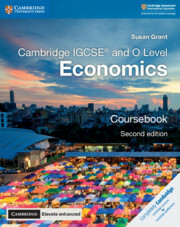 With a new central question for each chapter in section 2, students explore economics in the real world and begin to think like an economist. Section 1. Introduction: 1. What is economics? Section 2. Key economic ideas: 4. Should the school leaving age be raised? 5. Why are some brands of trainers (sneakers) so expensive? 6. Why do some footballers earn more than $30 million a year? 7. Why are some people poor? 8. Why do the Chinese save so much? 9. Why do some firms go out of business? 10. Do shoppers benefit from firms getting larger? 11. Why does pollution occur? 12. Will we run out of water? 13. Why do governments tax cigarettes? 15. Why did shopping take so long in Venezuela in 2017? 16. Why do some people leave Mexico to live in the USA? 17. Does it matter that the Japanese are getting older? 18. Why are some people unemployed? 19. What jobs will we be doing in the future? 20. Why does the USA buy clothes from Pakistan? 21. Why does the Indian firm Tata produce cars, steel and salt in the UK? 22. Will we have trade wars in the future? 23. Which country will have the strongest economy in 2050?